This post describes the concept of injection dependencies along with an implementation of the Cake pattern. Dependency injection is a design pattern that has been widely used in Java, by leveraging frameworks such as Spring. The objective of the pattern is to replace hard-coded dependencies with run-time association or injection of new type. Java defines modules or components through the semantics and convention of packages. The functionality of a module is defined through one or more interfaces and implemented through the composition and inheritance of concrete classes. Polymorphism is used to "dynamically wire" those classes, assembled through composition and inheritance into patterns which address a specific design problem (publish-subscribe, strategy, factory..). However those capabilities have been proven limited for creating very dynamic and complex applications. 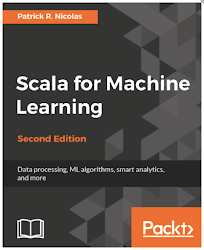 The Scala programming language provides developers with a dependencies injection mechanism based on self type annotation and that does not rely on 3rd party framework. The simplest and commonly used form of reuse in any Object Oriented Programming is Inheritance. Let's consider an interface House which is implemented by an abstract or concrete class 'House with Furniture & Appliance" which in turn is sub-classed by a well defined House. It is well documented that inheritance is a poor mechanism for code reuse because data is not properly encapsulated as a sub-class may access internals of the base class. Moreover any future changes in the base class of interface (Framework) will propagate through the sub-class (dependencies). It is a well documented and researched fact that composition provides a more robust encapsulation than inheritance as the main class delegates or routes method invocation to the appropriate internal components. Contrary to inheritance for which changes in the base class may have unintended consequences over the subclasses, changes in components or inner classes can be made independently of the main class or outer component. Framework such as Spring have introduced the concept of Inversion of Control Containers (IoC) and dependency injection which is a form of IoC. In case of inversion of control, a framework define interfaces which are extended or implemented by the application or client code. Instead of having the application using the Framework API, the framework relies on the application for implementing a specific function. Let's take the example of a generic service,Service that access a database using Java. In the example above, a concrete implementation of DbAccess interface such as mySQLQuery can be injected (as passed to the implementation of the service, line 9). The database access instance is used to enable the query and return a JSON object (line 14). Scala provides the developer with a similar and powerful mechanism to inject dependencies to a concrete class, known as Cake pattern. 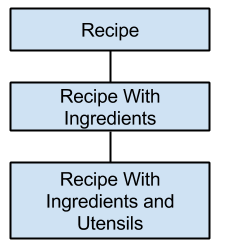 Let's consider the recipe example above. A House requires not only Furniture, Appliance but a Layout plan with step by step instructions. Each piece of furniture is defined by its name, category and price. More specific categories of furniture such as PatioFurniture and BathroomFurniture can also be created with similar arguments. A house contains also appliances and require a layout plan to be setup. An appliance has a name, price and a warranty if needed and available. The class Layout is instantiated with a name and an option. The goal is to furnish a house with a combination of appliances, pieces of furniture, following a layout plan. The implementation computes the total cost, once a combination of furniture, appliance and layout is selected. To this purpose, we create several modules, implemented as a trait of type FurnitureModule (line 1) to encapsulate each category of furniture. In our case the FurnitureModule define patio furniture, PatioFurniture (lines 6, 10).The bathroom furniture, instance of BathroomFurniture (lines 15- 19) is wrapped into its dedicated module BathroomFurnitureModule (line 14). can be applied either separately or all together. The same strategy is applied to the Appliance and Layout. A single class Appliance (line 4) with two constructors (lines 4 & 6) is enough to describe all types of appliances in the ApplianceModule space or scope. The same concept applies to the LayoutModule component (lines 12, 17). The factory class, RoomFurnishing,(line 1) relies on a self referential condition, using one of the components, LayoutModule and other components as mixin, ApplianceModule and FurnitureModule (line 2).. The factory class defines all the methods that is required to manage any combination of the components to enable us to compute the total cost (line 4). def movingDate: String = "October, 2013"
Here is an example how the client code can dynamically assemble all the components and compute the total cost. This technique combines class composition, inheritance, self-reference and abstract variables to provide a simple and flexible framework. The post also introduces the concept of layout or assembler to hide some complexity and become the primary mixin. I may elaborate on this concept in a future post. I strongly recommend the article written by Jonas Bonér on Cake pattern (listed in the references) to get in depth understanding on both the motivation and variant of this pattern.